James Addison Baker, III (born April 28, 1930) is an American attorney, politician, political administrator, and political adviser. He served as the Chief of Staff in President Ronald Reagan's first administration and in the final year of the administration of President George H. W. Bush. Baker also served as Secretary of the Treasury from 1985-1988 in the second Reagan administration, and Secretary of State in the George H. W. Bush administration. 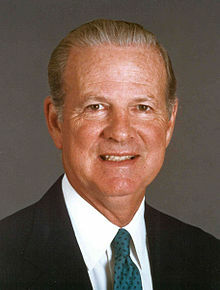 James Baker is the namesake of the James A. Baker III Institute for Public Policy at Rice University in Houston, Texas. ↑ "James Baker" at Baker Botts LLP; retrieved 2012-12-4. ↑ Baker Institute for Public Policy; retrieved 2012-12-4.